Quick, turn up the heat! Winter has arrived in the Comox Valley. We know our winters are long, cold, wet, and mostly cloudy. Over the course of the year, our temperature typically varies, meaning a lot of us will turn to our home heating system to stay warm. But Mr. Writer, I’m cold! What do you expect me to do!?! This tried and true practice seals the heat indoors. Have your home inspected and weatherized by contacting a professional to come evaluate your home for potential areas of heat loss. This way, you can address your home’s overall energy efficiency, and in turn, it could be a major way to ensure a big energy savings when the bills come due. Make sure the heat isn’t on full blast while nobody’s home. Another way to lower your heating bill is to consider adding a programmable thermostat to your furnace. This allows you to adjust the heat on a predetermined schedule, so you can lower the heat when you’re not home or when you’re sleeping. Use this time of year to wear warmer clothing in the home, a comfy pair of slippers and maybe a blanket on the sofa. You don’t have to bundle up; but wearing a warmer pair of pajama pants and a robe instead of turning up the heat will help a lot. It’s simple, quick, cozy and cost effective. No, not for warmth, but to locate any possible air leaks. Carefully hold the flame near your windows, doors and anywhere you think there could be a draft while you look for smoke moving horizontally. If you see it, that means you’ve spotted an air leak, and it likely means heat is escaping your home easily. By having these leaks sealed up, you can significantly reduce the amount of heat loss. With proper maintenance and an inspection from the professionals at Thermo Tec Mechanical, you can have a more efficient heating unit. It is recommended that all heating systems, get professional attention at least once a year. Also, here’s a step you can take all on your own: Remember to check the filters in your heating system and make sure they’re clean and clear. Dirty filters lead to higher heating costs. 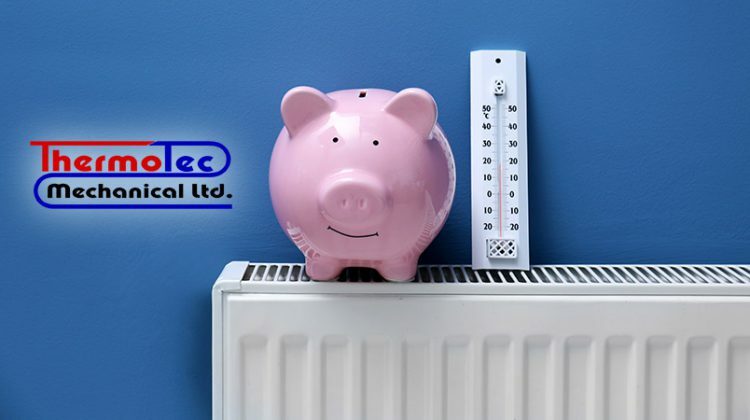 We hope that these tips and tricks help you lower your heating bill this winter and if you need further advice and guidance, visit the folks at Thermo Tec Mechanical. They have over 35 years of experience in the heating and air conditioning field in the Comox Valley. Their staff of HVAC technicians are enthusiastic in their commitment to providing customers with competitive quotes for installations and top-notch services. They also provide preventative maintenance programs tailored specifically to your needs and 24-hour emergency service as well. If Thermo Tec Mechanical can be of any assistance in any of the above areas, please do not hesitate to visit them here: www.thermotec.ca.